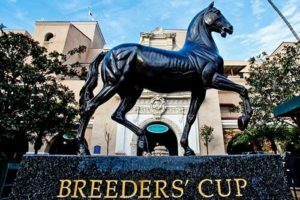 To bet successfully on the Breeders’ Cup Distaff race, you need to be aware of each racing horses’ statistics and records in order to make an informed bet. Also, the races age and weight influence its performance. This is why horses that enter this race are vetted through a weight for Age scale developed back in 1860 by Admiral Rous. The Weight for Age (WFA) scale takes into account the distance of the race, the horses’ age and weight. The distance is important because younger horses do not have the stamina older horses have. If the WFA scale was not used older horses would always win and where’s the fun in betting on obvious results? Wager simpler bets such as the win, place or show bet. If you decide to go for exotic bets try sticking to Exacta, Quinella and Trifecta bets. They require less accuracy and yield decent payouts. Set a betting budget and stick to it. In the history of the Breeder’s Cup Distaff only three horses have ever won the race more than once. All three horses managed to win the race twice, two won it consecutively while the one had a two-year gap in between wins.